QRadar SIEM Security uses cybersecurity AI and machine learning technology integrated into its scans, alerts and reports for security automation, efficiently pin pointing true threats of internal and external attacks. QRadar SIEM Security 4412-Q2A appliance accurately detects and prioritizes cybersecurity threats and internal user violations with embedded security AI, user behavior analytics and machine learning technology. QRadar SIEM Security appliances can be deployed as an All-In-One security information event management appliance, or as a dedicated event log processor, network traffic flow processor, console, risk manager, vulnerability manager, log manager or an event log plus flow processor combination. Each SIEM Security QRadar appliance can be changed into any SOC role at any point in time, and additional SIEM Security QRadar appliances can be added for expansion. QRadar SIEM Security tools are available for purchase as an Appliance, Software, VMware, SIEM in the Cloud and SIEM MSSP offering. QRadar pricing is based on the number of Events Per Second and Network Flows Per Minute that will be ingested by the SIEM. QRadar SIEM Security products incorporate cybersecurity AI for identifying external threats and vulnerabilities by embedding this data into your searches, scans, alerts and reports, saving your team many hours or days researching, investigating and identifying threats. Compared to other SIEM security tools, QRadar provides the features you need out of the box so you spend less time implementing and less money on additional add-ons to accomplish your objectives. QRadar security has significantly more log correlation integrations with technology you have in your environment than other SIEM tool. SIEM security product reviews show QRadar is the most mature solution on the market, providing the fastest implementation times and capable of parsing thousands of vendor’s logs with pre-defined searches, alerts and reports. Even more beneficial is QRadar’s advanced security intelligence features that automate the pinpointing of security threats, attacks, risks and vulnerabilities using cybersecurity AI feeds from external sources. If your company uses another SIEM, your security analysts will need to dig up their own security intelligence and rely on their own expertise for identifying threats and vulnerabilities. Put simply, QRadar SIEM Security efficiently filters out the clutter to pin point true threats and vulnerabilities using cybersecurity AI and behavior analytics machine learning to detect both internal and cybersecurity threats using real-time security AI. No other SIEM on the market has these capabilities, nor are they as quick to deploy and simple to operate. Above dashboards are customizable and have ability to add 255 additional dashboards per user. Storage: 12 x 3.5 inch 6 TB SAS 7.2 K rpm, 72 TB total; 3129: 48 TB (RAID 6) available to store event and flow data. 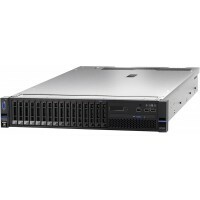 All other xx29 appliances: 58 TB (RAID 6) available to store event and flow data. BigFix provides real-time status of patches and fixes that need to be deployed for vulnerabilities on every endpoint (including software and databases), regardless of OS, and can apply patches and fixes automatically regardless of their geographic location. AppScan identifies vulnerabilities in web and mobile applications, and recommends fixes. Network Insights includes Layer 7 network inspection, but also includes Files, Applications, Emails, Chats, HTTP, DNS and other deep level tracing of IPFIX packets. Network Forensics for tracing the steps of the personnel or cyber criminals involved, by reconstructing the attack for triage and identifying the scope of the incident and everyone that was involved. Warning: If you enjoy threat and vulnerability hunting, you will not like QRadar Security SIEM. Lucky for you, hunting season is open 365 days a year, 24 hours a day. Happy hunting!